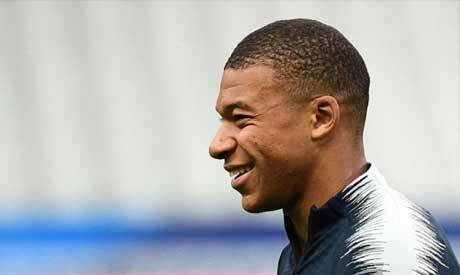 French phenomenon Kylian Mbappe has handled his rise to superstar status very well, national coach Didier Deschamps said on the eve of a friendly international with their great rivals Germany. The 19-year-old from the Paris suburbs is on the front page of the current edition of American weekly magazine Time, and was one of the stars of the Russian World Cup this summer. Asked if the attention had gone to Mbappe's head, Deschamps dismissed the notion out of hand. "Not at all, he's no big head. Even if he's in the papers or on the cover of Time and has become world famous," said Deschamps of his star player. "He's handling it all really well." "He knows where he's going and none of this will derail him, he's just not a big-headed person," said Deschamps. In his last match for PSG, Mbappe tore Lyon to shreds last Sunday with four goals in 13 minutes. Against Iceland last Thursday, Mbappe was due to have a restful evening on the bench, but with France trailing by two goals, he came on, and forced an own goal and converted a penalty to salvage a draw. He became only the second teenager in history after Pele to score in a World Cup final in July, netting in the 4-2 victory over Croatia in Moscow. The transfer fee of 180 million euros which PSG paid Monaco for Mbappe is not far behind the world-record 222 million euros they parted with for Brazilian star Neymar.